Zoom in to see the Webb's subsystems (image credit: STSci) or launch the Webb 3d Model for more detail. The list will be updated approximately every month. 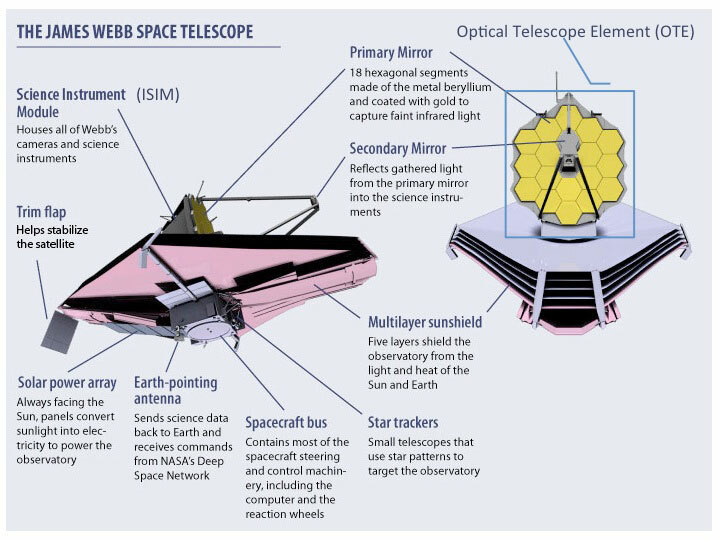 The image to the right points out various major hardware components of the observatory referred to in the tables to orient the reader (click '+' to expand). You can also explore the spacecraft in more detail with the Webb Interactive 3d Model (requires Flash plugin). Spacecraft Flight Software Build 2.2 Test Readiness Review Delayed to 4/30/15, 5 mo. Schedule slack to need remains. Deliver MIRI Cryo Cooler "Cold Head Assembly" (critical component of MIRI cooling) to ISIM I&T Flight CHA to be delivered in June 2013. No schedule, impact, work around in place.